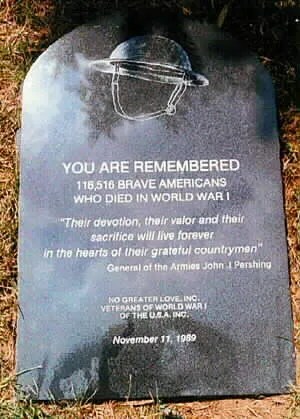 This site is dedicated to all past and present serving members of the U.S. Army National Guard who uniquely sacrifice of themselves for our freedom while walking in two worlds… Remember the Fallen. Special thanks to Ethel Avery Dolan without whose generosity this project would not be possible. Also many thanks to Donna (Anderson) Blews, Lanny Brown, Gilles Chauwin, Shane Colledge, John DiPesa, Bebe Granger, Gretchen Gudefin, John Hayden, Scott Kraska, Albert Landers, Richard Martin, Shawn Pease, Michael Rottler-Gurley, and Patrick Valissant for their ongoing interest, collaboration and many valuable contributions. Special Thanks also to Don Troiani for permission to display his original artwork “Men of Iron.” This work may not be reproduced without express permission of the artist. Please follow the link for Historical Art Prints at http://www.historicalartprints.com/ in order to procure this and other fine works of original historical art. Thanks for stopping by O’Folks ( http://theelderlies.wordpress.com )and letting folks know about your site. I think the WWI letters blogs are an interesting and useful idea. Wonderful site. 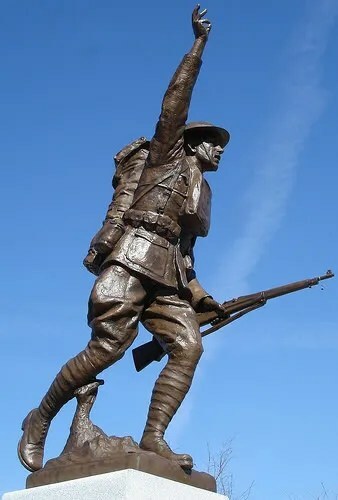 My grandfather was in the 26th in WW1. He was 1st Sgt., Co C. 101st Infantry. I also have many of letter that were preserved by our family from “The Border” and “Over There”. I’ve published the Border material on lulu.com. I’m currently in the process of writing the “Great War” portion. 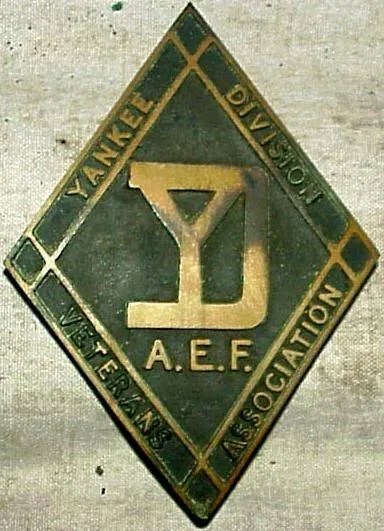 I’ve become a rather avid Yankee Division historian and have collected many of the written unit histories from the Division and I also collect general postal history of the 26th (letters, postcards, etc.). 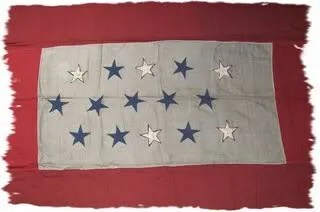 My grandfather also fought in the YD in WWI–103rd Field Artillery, Battery C. I have been trying to find many of the unit histories, I’ve found a handful, and would be interested to see a list of the titles you have. According to my father, my grandfather is prominently mentioned in one of them but he can’t remember the name of the book. Seeing a list may help. 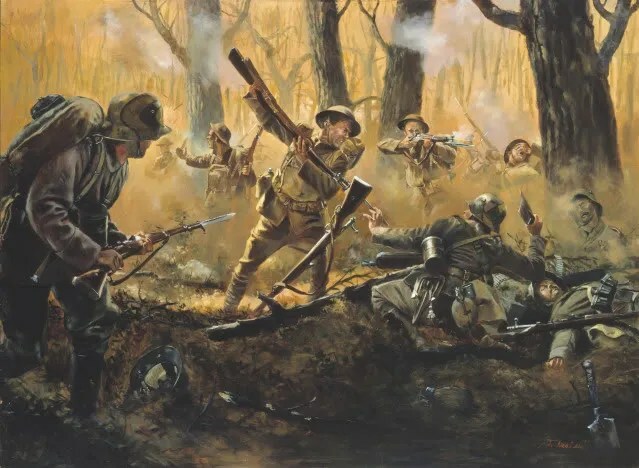 All the titles which I either personally own or have read regarding the history of the 26th “Yankee” Division during the First World War can be found on the Bibliography Page here. I know that the individual units composed official histories prior to the time of their demobilization and discharge in April, 1919. The only unit history I have been specifically concerned with here is the 103rd Infantry, but I’m sure that information on the 103rd F.A. is also out there somewhere. Henry T. Samson & George C. Hull. 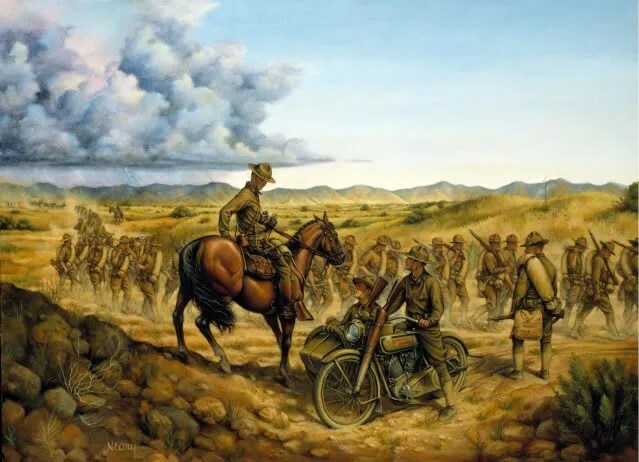 The War Story of C Battery 103rd U.S. Field Artillery. 1920. This work was privately printed containing 248 pages and photos. Thanks for the reply. I’ve actually read that book and my grandfather Francis C. (Frank) McCormick is mentioned in there once (possibly twice, one reference is vague) but my father doesn’t think this is the book. He remembers reading a story about his father being pinned down by enemy fire (he was a forward machine gunner) and another story of him shooting down a plane. 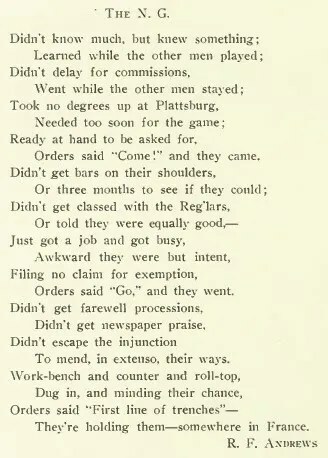 I’ve also read “With the Yankee Division in France” and one other about the 103rd FA but no mentions. Anyway, thanks again for the response. I’ve just found your blog from a reference in the Harry Lamin blog so I look forward to catching up on this one. Thanks Dom! I have forwarded your email to Andy separately to make sure he gets it. I’m thrilled to see your website. 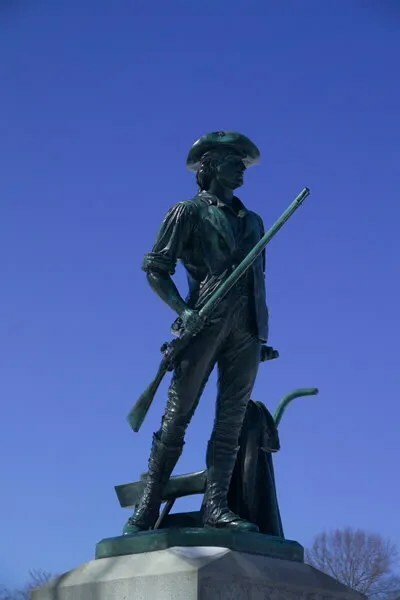 My father was a farm boy from Pittsford, Vermont when he enlisted in a National Guard Unit from Burlington, VT. Because he was a healthy farm boy, he volunteered for a scientific experiment involving Trench Fever. He was the only one selected from Vermont to participate. There were 60 Volunteers for this experiment which was very painful and could result in death. Thirty five of them had fastened to their forearms big bags of body lice, taken from clothing of men who had come down with trench fever, and 25 were injected with blood taken from trench fever victims. 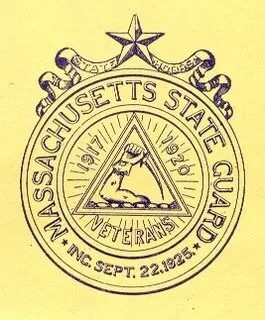 He was with the Field Ambulance Corps from Framingham, Mass. This site is wonderful. I have always found the letters of soldiers to be fascinating, and you have done a lot to organize, present, and explain the material. It’s going to take me a while to explore all the offerings here—I’ve been doing a little dipping in here and there, sort of randomly. There are a lot of angles on WWI that interest me. I plan to continue studying the subject after I finish writing my series on Deneys Reitz in the war. This is great! My grandfather was a Master Sgt 102nd FA Edwin H Poulton, joined 1916, went to Mexico, then France. 102nd was from CT: Battery E was from Branford. My dad has a box full of letters from the front to my grandmother, who he married after the war. I have a couple of photo post cards and one photo of the whole unit at Camp Curtis,Boxford Mass, if anyone would like to see it. Wonder if anyone has any photos from France or Mexico of the Battery? We also have a menu from 1916 XMass from Fort Bliss Tx. This is the most wonderful website I’ve ever visited for the history and quality of layout and ease of use. Fabulous work! Dom, Are you looking for information on Omer Mather of New Bedford, MA. I saw a posting of yours on Rootsweb. Omer is half-brother to my grandfather. Please contact me. AFTER WWII SERVICE, I LIVED WITH MY UNCLE. ALBERT TRACY IN PROVIDENCE, RI. HE SERVED IN THE WW1 103RD BATTERY C 26TH DIV AND EARNED THE SILVER STAR AND PURPLE HEART.I HAVE BEEN SEARCHING FOR YEARS FOR DETAILS, THE RECORDS BURNED IN ST. LOUIS FIRE.I AM GOING TO TRY TOMORROW TO FIND THE SAMSOH/HULL BOOK IN HOPES IT MENTIONS HIM. I actually wanted to thank you for visiting my blog and thought I’ll come and visit too. This is a wonderful site, I have a particular interest in letters from soldiers since I read one of my grandmother’s books as a child, WWII but still great, letters from Stalingrad. WWI is of particular interest to me. I am going to review one of the best WWI movies on the weekend “Joyeux Noël”. I will return when I have more time, it is really a fascinating site. My great uncle, Corporal Joseph Maus, was in the 27th Division, 105th Infantry who was killed in action in France on 9/29/18. I have a number of questions. As next of kin, can I apply for his Purple Heart? I have a letter from the Red Cross at the time regretting that they were not able to locate a gravesite for him. Could this have changed. Also, I have all of his letters to his sister, my grandmother, from May through September, 1918. They are numerous and long (and very interesting, especially the ones written from the trenches). Is is worth transcribing them and what is the best way to preserve the originals. Thanks! My grandfather (Nicholaus Blei) was with the 103rd like Sam. He was in Co. G. Interestingly, like me he was from Chicago. I think he was in Illinois’ Nat’l. Guard. I have pictures of him in Texas along the Mexican border with other soldiers. I don’t know the timeline however. He wound up in Westfield and Ayer with the 26th months later. How? I recently retired and I’m hustling to put a family history together. Your site has helped immensely…Thanks. Ironically, my older brother married a New England girl and lives a stone’s throw from the old Yankee camps. Gramps didn’t talk much about the war, though he did receive a purple heart in 1933 for wounds in the Meuse Argonne. He also left nice artifacts, though most disappeared after his death. I’ll be visiting my brother this summer and would love to meet you. In the meantime I’ll keep searching for more information. Are there any sites you have found most useful? Genealogical or War Dept.? By the way, My grandfather spent a lot of time in the V.A. called Hines (outside of Chicago). Ironically, they have a wonderful statue of George Dilboy there!! Who would have thought and in Illinois another member of the 103rd lives on. Thanks again for the website. You have amazing talent and devotion !! Fascinating site. Both my grandfathers were in WWII, in the Sea Bees and Army Medical. In response to Claude Foutch, I have a copy of “The War Story of C Battery” of the 103rd FA which contains a listing of all who served in the unit from the rank of Captain down to Private. Unfortunately I don’t see anyone named Birch or Bjerke in the roll. To Lawrence O’Rourke who posted on 5/23/2010, Sgt. Albert J. Tracy is listed in the roll from “The War Story of C Battery” as being from Uxbridge, MA. I don’t know if this helps in your search for his records. There is also a 2nd Lt. William T. O’Rourke from Providence, RI. Might he be a relative as well? 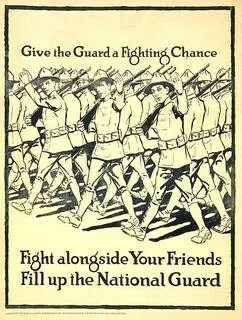 I am the command historian for the Maine Army National Guard, doing considerable work on the 103rd Infantry. I would love to be able to contact you about some questions I have, as well as to offer any assistance I can to you and those you assist. Is there a good email where I can contact you? Would you mind adding his picture to your blog page? How can I send/post it? Thank you.